Welcome to the My Disney Experience issue. This is one of the most important issues we’ve done because My Disney Experience is everywhere at Walt Disney World. From making dining reservations to your tickets to FastPass+ to even where the nearest restroom is, My Disney Experience is involved. My Disney Experience is here to stay. 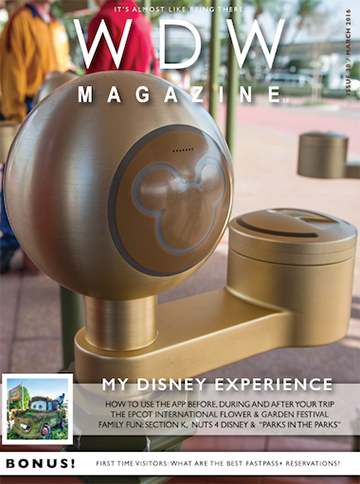 That’s how we kick off this issue of WDW Magazine with an article about the importance of the My Disney Experience (MDE) program to Walt Disney World. Then we talk about the History and Future of MDE, the top 10 ways to use it, and a look at how to set up your My Disney Experience account. 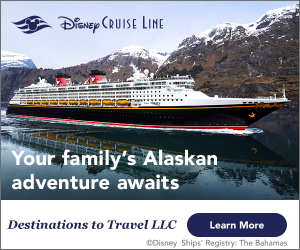 Want to know the best way to use FastPass+? We’ve got it. In our Helping Hands section we also have an article about how to avoid sun exposure problems. This month in the Best of WDW we feature the Pop Century, Morimoto Asia, the Princess Fairytale Hall and D-Tech locations. Wow. That’s a great list. Section k! is full of some great stuff for kids. We have our downloadable puzzles, games and coloring pages. Wally D. is back with one of his new friends. We learn how to make Mickey Peeps and our monthly Video from Emily about Disney Springs. The Fanzone starts off with a look at our monthly poll. James sends a letter to Walt Disney himself. Our recipe of the month heads over to Be Our Guest and looks pretty yummy and we have the very latest information from the Vinylmation and Tsum Tsum world. This month our Special Report is really Special and really colorful as we take a pictorial look at the Epcot Flower and Garden Festival. You don’t want to miss this month’s Around the World section. This month we have the big Disney News (and boy is there some big Disney News, a little bit of March History, and some really fun Trivia. If you have a sweet tooth, you’ll see how candy gets made at WDW and finally we have a throw down between WDW’s Indy Speedway and Disneyland’s Autotopia. It’s that time. Time for you to punch the button and check this month’s great issue out.